Daily life can be unpredictable at times. ItÕs easy to miss something that you do every day when you're stressed out or tired. Sickness takes a toll on the body and the only way to move forward is to make sure you take your medication and rest. However, sometimes illness requires more than just a pill for a headache. Organization is the key to getting better and becoming your old self again. 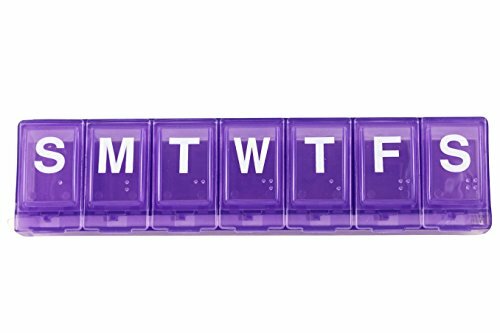 With a compartment for each day of the week, split up your doses for different daily medications and vitamins so you don't need to search through the medicine cabinet while trying to get out the door in the morning. Each box is a labeled with the first letter of the day of the week in bold lettering, helping to distinguish one from the next while groggy or in a rush. Add this storage set to your medicine cabinet as a reminder to yourself to stay healthy. 3-PACK: Order contains 3 pill reminders in total. MEASUREMENTS: 6 x 1 x1 1/2 x 1 Inch. Big enough for all your medication and vitamins needs. CONVENIENT SIZE: lids marked with braille and letters for each day of a week. Snap shut compartments. Rounded bottom make retrieving medication easy. SAFETY-LOCKING DEVICE: Prevents compartments from opening easily in purse or briefcase. Just push in on white tab on left side of box and open a compartment to retrieve a pill. When you are done, snap shut. Compartment is locked shut. REPLACEABLE LOCKING DEVICE: Open all compartments and slide bar back into place. Then close all compartments.